Mountain High is a 2,200 square foot log home with 3 bedrooms, 2 baths and a large sleeping loft plus a covered deck with comfortable seating. It sleeps 6 in the bedrooms and 4 with ample room in the loft. The cabin sits on 10 acres of forested land on the upper slope of a mountain overlooking Hahn’s Peak to the east and Wyoming mountains to the north. The drive up to the cabin from 129 takes about 10-15 minutes and weaves through aspen and pine forests. The road is not paved so while sedans do drive up there, a car with adequate ground clearance is suggested. The views are stunning: you can occasionally see hikers climbing Hahn’s Peak, and during thunderstorms in Wyoming you can see the sheet lightening illuminating the clouds and mountains in the distance. There is nothing quite like it. If you want to stay in the valleys of the Steamboat area, don’t stay here; this is true mountain living at its best. You look down at the world from here, not up. Located on a private road used mostly in the winter by cross-country skiers, you will find total privacy and quiet: no cars whizzing by. Three bedrooms are located downstairs: two with queen sized beds and one with a double bed, plus two full bathrooms, one with an over-sized bathtub. On the main floor is a huge living room/dining room and kitchen surrounded on two sides by walls of windows. The dining room table sits 8 plus there is a second table that can join to it and add two more for a total of 10 seats at the table. An efficient wood stove is available for cold mornings, though the sun warms the place quickly. A circular staircase takes you up to a large sleeping loft with two beds and several Japanese futons. A large deck with cushioned patio chairs and a table sits outside the living room on the Hahn’s Peak side of the cabin. A large BBQ grill on the patio is available for your use. There is also a a fire circle just below the house that can be used to grill food (or marshmallows!) outside on cool evenings. Games such as Pictionary, chess, checkers, Monopoly, Global Pursuit, backgammon and others are stacked on shelves in the living room. A stereo system with CDs, books, and a small selection of some very difficult puzzles are also available, plus a large chest full of children’s toys and art supplies up in the loft. This is an artist’s residence so you are surrounded with antiques from Asia and South America as well as paintings and other artworks. Within a few miles you will find Pearl Lake, Steamboat Lake, Hahn’s Peak Lake, hiking galore, and Hahn’s Peak village for restaurants, a gas station, and other amenities. The Hahn’s Peak area is known for fishing, hunting, waterskiing and boating, biking and mountain biking, horse back riding, ATV tours, and of course, viewing wildlife. A 5 minute walk back through the woods gives you a view of Steamboat Lake, Pearl Lake, Hahn’s Peak Village, and Steamboat Mountain in the distance. Steamboat Springs is a well known skiers paradise, but is even more popular in the summer for its weekly rodeo, hot air ballooning, craft shows, music festivals, river rafting, fishing, biking as well as numerous restaurants and interesting gift shops. We live on Guam, a small island in the Pacific Ocean east of the Philippines. Gyongyi is an associate professor for the University of Maryland in Asia: Guam campus. She teaches Marine Biology and related sciences. Frank is administrator for a medical clinic. We have two daughters and three grands. We have spent every summer and a few Christmas's at our cabin since we built it in 1986. This photo is us with our first grandchild: Cali. We purchased the 10 acres sight unseen with my mother. When we first visited the property and sat on the one small clearing where the original owner (a friend of my mother's) suggested a house would have the best view, we were totally unprepared for the beauty around us: it is the polar opposite of our home in Guam. We decided on the spot to build a log cabin, a large one to accommodate all 5 of us, and did so the following summer. Each year since then we improved the house by adding a huge sleeping loft for guests, hardwood floors and other features. Although Guam may seem to most a small place, in comparison it is a busy, cosmopolitan island with traffic, many people (OK, only about 170,000 :o). Going to our cabin each summer was a breath of fresh air, not to mention NO WORK! :-) We never put in a satellite dish for TV on purpose to allow us to do other things with our time. Once we arrive in our mountain cabin, that is as far as we go: friends and family come to stay with us. It is a place to gather for our far flung family from all over the states, other parts of Asia and Europe. It is our place of refuge, and party place, all in one. Both bathrooms have shower tub combo with tiled floors and granite counters with porcelain sink. Hahn's Peak is seen right outside our patio window and the mountains of Wyoming about 13 miles away are seed from our living room windows. Everything you need, pots, pans, wok, casserole etc. Stovetop espresso maker and regular one cup at a time coffee maker. Kitchen completely renovated in summer 2016 with red cabinets and granite countertops and tile floor. Fully stocked with pots, pans, glassware, dishes, all utensils, spices, coffee makers. Bring food! Table seats 8 plus a second table can be added to seat two more. Comfortable with great amenities. We had a great stay at Mountain High! This was the perfect Fall getaway for my husband, myself, and our two dogs. The colors were beautiful, the air crisp, and the views spectacular! There were deer in the yard daily, the chipmunks were industrious and entertaining. This house is beautiful with unique artwork, batiks, weavings, and pottery. The furniture is comfortable and the feel of the home is cozy. We had everything we needed in the kitchen and throughout the house. The road up and down is rough, but easily passable in a higher-clearance SUV. Thanks so much for sharing your mountain cabin with us! Thank you so much for the review! Our cabin has always been magical for our family and I’m so glad you enjoyed it too! Have a great year! 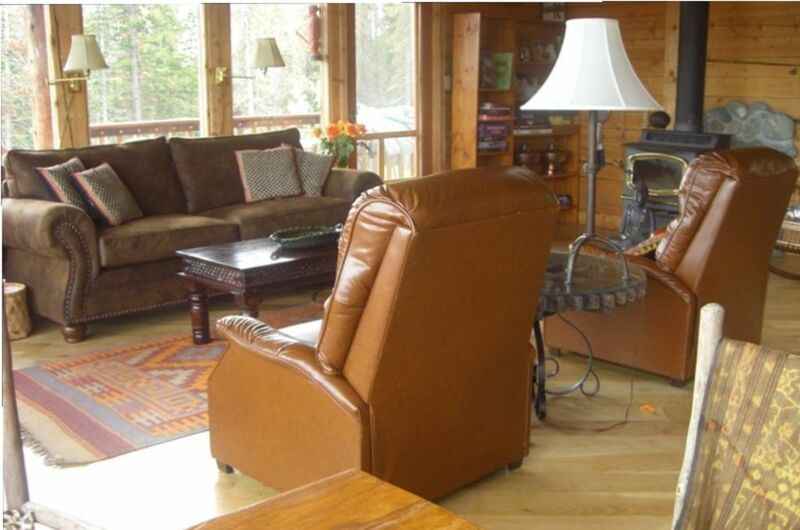 Beautiful cabin, stunning views, everything is just like it is described. We had a wonderful time watching the antics of the hummingbirds, the chipmunks, and the deer from our windows and the deck. Our family of four (three generations) stayed for four nights during the week of our son's wedding at Midnight Ranch, just down the road. It was so much better than having separate hotel rooms somewhere else. The road to get up to the cabin is somewhat of a challenge: deeply rutted, rocky, and with large puddles. We highly recommend having an SUV, which fortunately we did. It took us about 12 or 13 minutes to get from our cabin to the main road each time we left. It was about 25 minutes to Midnight Ranch and 45 minutes to Steamboat Springs. We took a hike up the mountain each morning in order to get a phone signal, where we enjoyed the beautiful view of the lake. Thank you for sharing your beautiful cabin with us. Thanks so much for the wonderful review! Maybe one day you will return! Comfortable & Clean with a wonderful view! Our family went to this great cabin to have time away together. It was a wonderful trip and location as it was close to fishing and hiking. The kitchen was well stocked with cookware which was great! We will absolutely recommend. Definitely bring up a car that has some clearance as the roads to the cabin are a bit rough....but worth it! Thank you so much for the lovely review, hope to "see you" again! An amazing place to stay! My wife and I stayed here with two other couples for an atv trip. This cabin was perfect for what we were doing. The owners had very good communication and were very helpful. It is true mountain living and we loved every minute of it! Has beautiful views of Hahn's Peak and we saw several mule deer right from the deck. Don't try and take any form of trailer up to the cabin as it is hard navigating and there is no place to turn it around when you get to the top. Thank you to the owners for sharing their amazing cabin and we will definitely be returning! Thank you and so happy you enjoyed our home! And you are absolutely right, it is not a good place to bring large trailers because there is no room to turn around. Again, thanks! We truly enjoyed our stay at Mountain High. It was great to be in the middle of a beautiful forest with views of distant mountain ranges and Hahn's Peak, but still be close enough to enjoy the activities at Steamboat. The cabin was comfortable and had everything we needed. The kids loved the loft and we loved the windows and deck. You can't beat the star gazing at night! I add $10 per guest per night for more than 6 guests. I add $10 per dog per night.